Apartment investments will maintain a positive outlook in 2018 as the combination of steady job creation, healthy demographics and an accelerating pace of household formation sustains renter demand. The consistent flow of newly developed units, a top of mind consideration for many investors, increased competition for Class A apartment assets in cities with disproportionate deliveries. The effects of the additions tend to be concentrated, and the deliveries will wane in the coming year, supporting sound performance metrics in most markets. Class B and C workforce housing will continue to outperform as vacancies in these properties remain at historical lows, enabling owners to justify strong rent growth. t from increased clarity on tax laws. The revisions to the tax code are largely benign for commercial real estate, maintaining virtually all of the features most valued by our industry. Key provisions such as the 1031 tax-deferred exchange, mortgage interest deductibility and depreciation rules changed little, empowering continuity in most investment strategies. In addition, changes to tax codes on pass-through entities could provide an incentive for many investors to re-position portfolios and allocate additional capital to the sector. This combination could invigorate investor sentiment, bolster decision making and raise market liquidity. 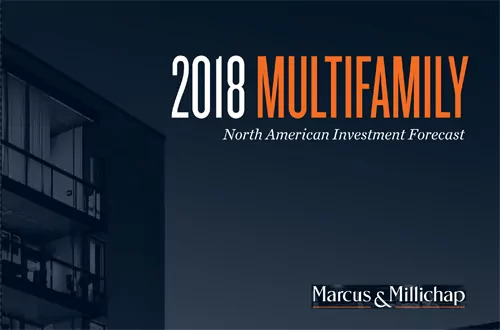 Undoubtedly, new challenges will emerge in 2018, but numerous forward-looking metrics still point to additional runway for multifamily investments. As you re-calibrate your investment strategies in this dynamic climate, our investment professionals stand ready to help you evaluate your options and implement your strategies. The top two markets last year trade places in 2018. Driven by robust employment in the tech sector and soaring home prices that keep rental demand ahead of elevated deliveries, Seattle-Tacoma ranks first on the chart. The metro outperforms last year’s leader, Los Angeles (#2), which slid one spot. Sacramento’s robust rent growth and low vacancy pushed the market up 12 positions in the ranking (#8) the largest increase in the Index. Other double-digit movers were Orlando (#17) and Detroit (#28), which each leaped 10 places. Companies have considerable staffing needs, but with unemployment entrenched near 4 percent, they will continue to face challenges in filling available positions. These tight labor conditions should place additional upward pressure on wages, potentially boosting inflationary pressure in the coming year. The strong employment market, rising wages and elevated confidence levels could unlock accelerated household formation, particularly by young adults. One factor that could weigh on economic expansion under the new tax laws is the housing sector, which added just 3 percent to the economy last year, about two-thirds of the normal level. The new laws could cause home builders to reduce construction while shifting a portion of the housing demand from home ownership to rentals, and a rental housing shortage could ensue. Steady job creation, above-trend household formation and elevated single-family home prices have converged to counterbalance the addition of 1.37 million apartments over the last five years, at least on a macro level, easing concerns of over-development. In the coming year, rising development costs, tighter construction financing and mounting caution levels will curb the pace of new additions from the 380,000 units delivered in 2017 to approximately 335,000 apartments. Although the pace of completions will moderate in 2018, additions will still likely outpace absorption. Nationally, Class A vacancy rates have advanced to 6.3 percent in 2017 and will continue their climb to the 6.8 percent range over the next year. Vacancy rates for Class B and C assets will rise less significantly in 2018, pushing to 5.0 percent and 4.7 percent, respectively. Average rent growth will taper to 3.1 percent in 2018 as concessions become more prevalent, particularly in Class A properties. The Fed is widely expected to continue raising its overnight rate through 2018 to restrain potential inflation risk. Average apartment cap rates remained relatively stable in the low-5 percent range for the last 18 months, with a yield spread above the 10-year Treasury of about 280 basis points. Many believe cap rates will rise in tandem with interest rates, but this has not been the case historically. Debt availability for apartment assets remains abundant with Fannie Mae and Freddie Mac continuing to serve a significant portion of the multifamily financing, local and regional banks targeting smaller transactions, and insurance companies handling larger transactions with low-leverage needs. The prospects of a rising interest rate environment could weigh on buyer activity as the yield spread tightens. Cap rates have held relatively stable over the last two years, and the sturdy outlook for apartment fundamentals is unlikely to change substantively in 2018. The maturing apartment investment climate has continued its migration from aggressive growth to a more stable but still positive trend. To re-calibrate their strategies, investors are broadening their search and sharpening their efforts to find investment options with up-side potential. They have expanded criteria to include a variety of Class B/C assets, outer-ring suburban locations, and properties in secondary or tertiary markets.